Ideal Power announces the availability of the 43MPM20 series of DC/DC converters from P-Duke, an award-winning Taiwanese manufacturer. The 43MPM20 modules are 20W ultra low-profile Type CF DC/DC converters, certified to the 2 x MOPPs (Means Of Patient Protection) standard, making them the obvious choice for applications designed for direct patient contact. Ideal Power offers 35 different modules in the 43MPM20 series. 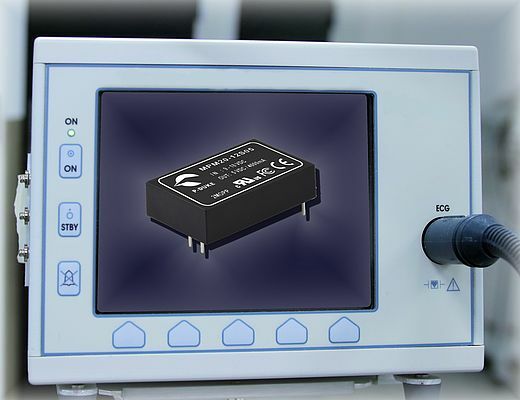 These provide a range of different specifications, with wide 2:1 or 4:1 input ranges from 9 to 75V DC, and output voltage options of 5, 12, 15 and 24V DC whilst offering single or dual output modules. The series also features impressive efficiency ratings of up to 90% in a compact 40.6 x 25.4 x 35.55 mm package. Typical leakage current for the converters is low at only 2µA, in addition to offering 5000V AC reinforced insulation. Featuring an internal filter meeting EN 55032 Class A standard, as well as boasting an operating temperature range of -40ºC to +105ºC (with derating), together with an operating altitude of up to 5000m, the series truly has a lot to offer. In addition the modules are designed with over-voltage, current, thermal, under-voltage and short circuit protection. Devices used in medical applications, in an area where patients might be present, require at least one Means Of Patient Protection (MOPP). In more demanding environments, the higher level of 2 x MOPPs is required. The IEC/EN 60601-1 standard determines the requirements for electrical safety in medical devices, and, how to protect against electric shock.